One of the enduring hopes of the digital age is that technology can break down the barriers between peoples and races. Joe Brewster and Michèle Stephenson explore this idea first hand in their compelling new documentary American Promise. A film thirteen years in the making, American Promise follows two African-American boys (one of them Brewster and Stephenson's own son) from first grade through high-school, showing the challenges and opportunities young black men face in today's education system. Currently playing in select theaters nationwide, American Promise expands to additional cities this week and will air on PBS in February of 2014. 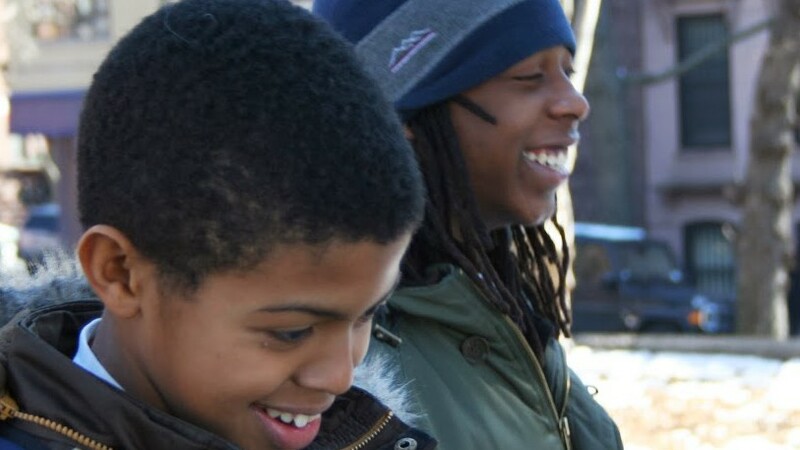 Winner of a Special Jury Prize at the 2013 Sundance Film Festival, American Promise follows Idris Brewster and his friend Seun Summers as they attend The Dalton School, an elite private school in Manhattan's Upper East Side. Despite the high hopes of their parents and teachers that Idris and Seun will succeed as part of the school's diversity program, the boys have trouble dealing with the pressures of their environment. In part this is because Idris and Seun have learning disorders that go undiagnosed for years, and in part it's because neither boy feels at home in the predominantly WASP culture of Dalton. Ultimately, Idris and Seun must balance their needs for self-determination with the high expectations of their successful, hard-charging parents. Ever since the pioneering anthropological documentaries of Robert Flaherty and Merian C. Cooper in the 1920s, and Albert and David Maysles 'direct cinema' documentaries of the '60s and '70s, the cinema has played a powerful role in collapsing the distinctions between peoples and creating a sense of empathy and common humanity. Michael Apted's acclaimed 7-Up documentaries took this idea a step further. An inspiration to Brewster and Stephenson, the series documented the lives of a group of fourteen English children at seven-year intervals, beginning in 1964 and continuing through today. The 7-Up series (the kind of project known in sociology as a 'longitudinal study') took advantage of the cinema's ability to master time, using the movie camera as an all-seeing eye to examine human lives over the course of decades. The observational capabilities of the cinema have been further expanded by the digital revolution, with low-cost digital cameras making possible the kind of lengthy, first-person videography that comprises American Promise. A classic longitudinal study, American Promise draws on an impressive accumulation of thirteen years of footage to distill insights about families and children that otherwise would go unnoticed in the rush of day-to-day life. As a result, American Promise elicits lessons that apply not just to African-American children, but to all children as they navigate the shoals of childhood and adolescence. As co-director Joe Brewster noted when we spoke at Sundance, "when people see the film, they get so immersed in the characters, these become their kids." The monumental size of the American Promise project required a special level of commitment from the filmmakers and their talented crew. As I chatted with American Promise's editors and videographers at Sundance (in the photo below with Brewster & Stephenson), it became clear what a labor of love the film had been for them. Editors Erin Casper, Mary Manhardt, and Andrew Siwoff and cinematographers Errol Webber, Alfredo Alcantara, Margaret Byrne, and Jon Stuyvesant all deserve kudos for their work. Intrigued by their efforts, I sat down with co-directors Michèle Stephenson and Joe Brewster at the Riverhorse Café in Park City to find out exactly how they did it. The interview has been edited for length. GM: What inspired you to start filming your son Idris and his friend Seun, and how did you handle the logistics of that effort through the thirteen years of the project? MS: Both boys were accepted at this prestigious school in New York City (The Dalton School) as part of this diversity initiative the school was engaging in to make it reflect more the diversity of New York City. So we were part of this initiative, and we decided to embark onto this journey. A few months into the process we realized we might have a story here about diversity, and celebrating it, and we wanted to keep honing our craft as filmmakers without the pressures necessarily of having to fundraise or finish something in a specific given time. So we gave ourselves this narrative arc that we would keep shooting and documenting until they would graduate from high school -- and we would come back to the project on a regular basis. So that's how we started. JB: We started off with a High 8 camera, and moved quickly to a PD 100. We recruited five of our son's classmates -- a diverse collection -- and you know what, over three years, three of them dropped out, the girls. And so we had two boys: both black, both from Brooklyn, and they had similar issues. MS: Yes... the story took a shift, and left the issue of diversity and became more a story about young black male achievement. What does it take to support these boys and give them the best education possible given the social and national context [of] the crisis that boys find themselves in terms of their achievement? JB: So, we initially didn't think that this would resonate nationally. [But] they're middle class boys, and they were having issues that seemed to go across the board. So, our initial tag line was: accepting the kids into your community is really just the first step. People tend to focus on the numbers and on structural impediments to obtaining good education, but they don't really think so much of the social and emotional stuff, and that is where these kids struggle. MS: But what is interesting about the film though and I think that resonates beyond the black male experience is that, because we went deep and intimate into the two family's experiences, the film has universal resonance around questions of "What does 'success' mean for families, and their children?" "What kind of parenting styles really allow for success for their kids?" And so because of those universal issues we all face as parents and as children and as educators, it resonates for a much larger audience as well. GM: Which is the best kind of thing to do. JB: So, people talk about [cinema] verité, and how it disarms the audience, people talk about fly on the wall. You have the camera there and then all of a sudden you don't realize that it's there. This is what we've been told: when people see the film, they get so immersed in the characters, these become their kids. When we walk out of a theater -- and we've tested it before groups of thirty people before this first screening [at Sundance] -- it forces people to think about their own children, whoever they are. People are talking about the issues they have with their own child, regardless of socio-economic status or race. GM: How did your son Idris and his friend Seun handle being filmed for so many years? MS: Well, there were ups and downs, in terms of (she laughs heartily) their level of commitment and involvement, and our roles as parents and filmmakers sometimes kind of blurred. I think they were kind of going with the flow until they hit adolescence, and then their resistance to the filmmaking process became more a resistance to us as parents, really. [JB: It was intense.] And we wound up negotiating with them the stuff we wanted to shoot or to keep shooting with them. One of our tactics was actually to choose younger shooters to hang out with them of the same gender. GM: I noticed that. I met two of your cinematographers. So the cinematographers were spending a lot of time at the high school end of things with them. JB: And also, we gave them a camera to shoot. GM: Ah, so they shot each other. MS: Yes, we gave the cameras to the boys to shoot. We actually open the film with one of the self-interviews one of the boys does. So we tried to give them a certain voice as well in the process. Even if some of the material didn't end up in the film, it gave them a certain sense of agency. But what's interesting is -- I'll just say this one last thing - they were kind of resistant because they didn't really know what we were doing, but having arrived at Sundance -- they came to the premiere -- I think it helped them feel proud and happy to have this document of their lives. American Promise is currently screening in select cities across the nation. 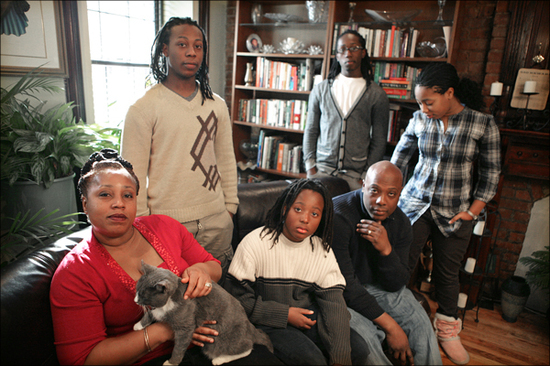 The documentary will also be shown on PBS's POV series in February of 2014.